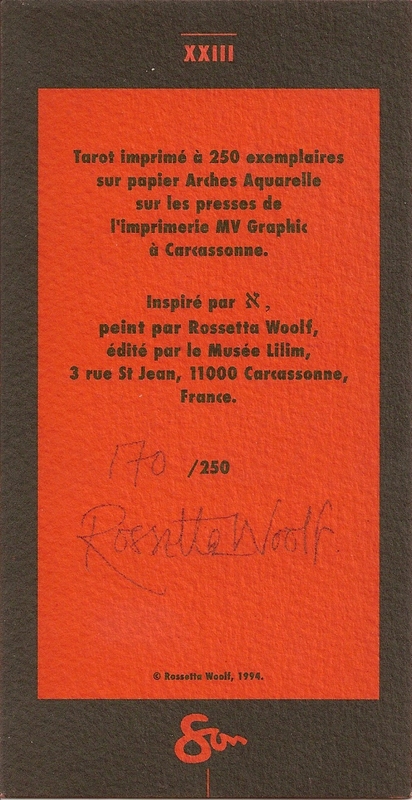 This deck was printed in 1994 as an edition of 250 copies for the Musée Lilim in France. In Kaplan’s Encyclopedia it was called the Cathar Tarot and listed as unpublished . In 2006 Adam McLean obtained the remaining stock from the artist, reboxed the decks and sold them as No.9 in his Artwork Tarot Series. 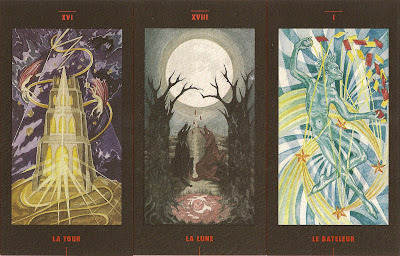 The images for this Tarot were abstract watercolor paintings by Rosetta Woolf based on the spiritual and cultural history of the Mediterranean and dedicated to the myth of Lilith and her children, known as the Lilim. The cards are a little longer ( 6.25 by 3.25 inches) than a standard size deck .